Need a way to confidently pitch your investment services? 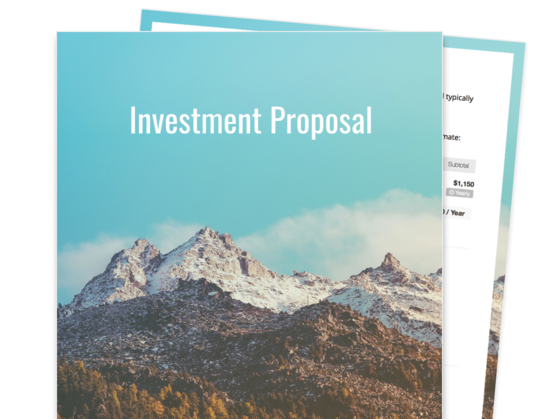 Use our polished and fully customizable investment proposal template to showcase your knowledge, professionalism, and integrity. Customize important components, such as those detailing your investment goals, services, and fee structure, to adapt easily to each new prospective client. Save time without sacrificing the quality of your investment proposal by filling out and customizing each area of the template. Highlight your company’s portfolio of investment products and your position as a leader in investments and asset management. Outline the investment strategy that you will craft for your client in order to reap maximum returns. Present a detailed and easy-to-understand pricing model and a breakdown of cost estimates for your services. Financial planners, advisors, or analysts who are looking to grow their experience with private or institutional clients. Make this section a personal address to your prospective client. Prove that you understand where they’re situated at this point in their finances, and what factors are driving them to consider investing. Afterwards, you can state that your investment strategy will be tailor-fit to fulfilling their personal financial goals. This section will brief your client on the history of your company, your mission and vision, and your team of professionals in the area of finance. List the educational experience, previous work credentials, and certifications of each member of your management team. Run your prospective client through the process of managing investments with you. This can include how you will match them up with an advisor, what types of investment instruments you think it would be best for them to explore, and deciding on the high-risk or low-risk investments that you think will bring them sound returns. In this section, fill out a template for your prospective client that includes their unique investment objective (for example, saving for retirement) and the potential investment amount. Calculate for the time that it would take for the ideal returns to be achieved. Emphasize that you are ready to help them learn about any parts of the investment process that seem too complicated or confusing. Cite the estimated fee for your services depending on how complex the investment plan is, and the timeframe for your investment management services. This is where you and your prospective client can finalize the proposal if they agree to the fee structure. The e-signature feature in this proposal template makes signing a snap. 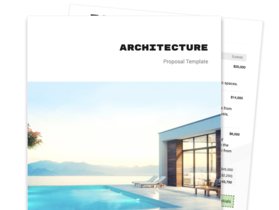 Save time and represent your firm well with this Architecture Proposal Template. This template includes a cover page, introduction, description of services, estimate, and signature page sections. 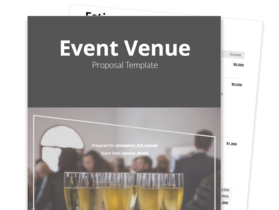 If you manage a venue and you're tired of sending proposals and estimates, look no further than this automated and polished event venue proposal template. 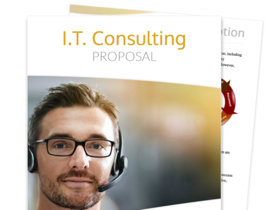 Whether you’re offering IT Service Management (ITSM), Professional Services, Software Implementation or Systems Integration, this Consulting Proposal Template will help you close the deal.